A crunchy crust filled with delicious, cheesy mac and cheese. What could be better really? The macaroni is cheesy, creamy, and delicious on its own. However, a crunchy crust made of crackers, cheese, and margarine is the vessel for this mac and cheese. I promise you, these are delicious and worth the slight amount of prep work. I was very surprised by how delicious these were. I didn’t know there could be so much flavor packed into the macaroni part. 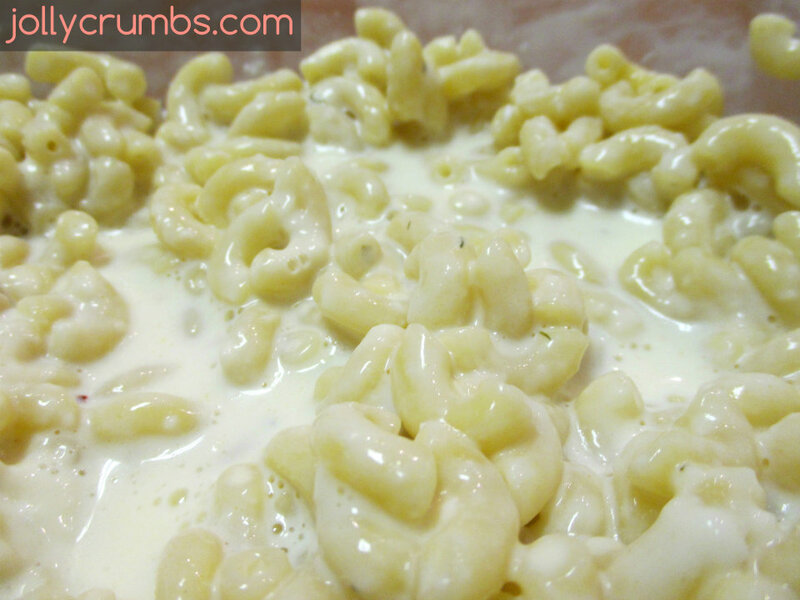 These are lightened up as far as mac and cheese goes, however they are still very cheesy and flavorful. Feel free to play around with the cheeses you use. You will love these little cups. They are perfect as a side, appetizer, or as a main for lunch or dinner. This recipe has two simple parts: the crust and the macaroni. To start with, we will make the cracker crusts. In a large bowl, mix together the crushed crackers, 1 cup shredded cheese, and melted margarine. Mix well until the mixture holds together and resembles coarse sand. If it seems dry, you can add in another tablespoon of melted margarine. Otherwise, divide the cracker mixture among the 8 prepared muffin cups. Using a spoon or your fingers, firmly press the crumb mixture into the bottoms and sides of the 8 cups. Go as high up on the sides of the cups as you can. Now for the macaroni part of the recipe, cook the macaroni for about two minutes less than the box directions call for. The macaroni will continue to bake in the oven, so you want to under cook it just a little. Drain the pasta fully when it is done cooking. Mix the drained, hot macaroni with the 1/2 cup extra sharp cheddar, garlic and herb spreadable cheese, and lite margarine together in a large bowl until everything is melted together completely. In a separate bowl, combine the egg whites, milk, sour cream, salt, and red pepper flakes. Mix well. Add the milk mixture to the macaroni mixture. Stir together until all the ingredients are melted and smooth. Place about 2 to 3 tablespoons of the macaroni mixture into each muffin cup. You will want to fill each cup up to the top. Place leftover macaroni into the prepared baking pan. 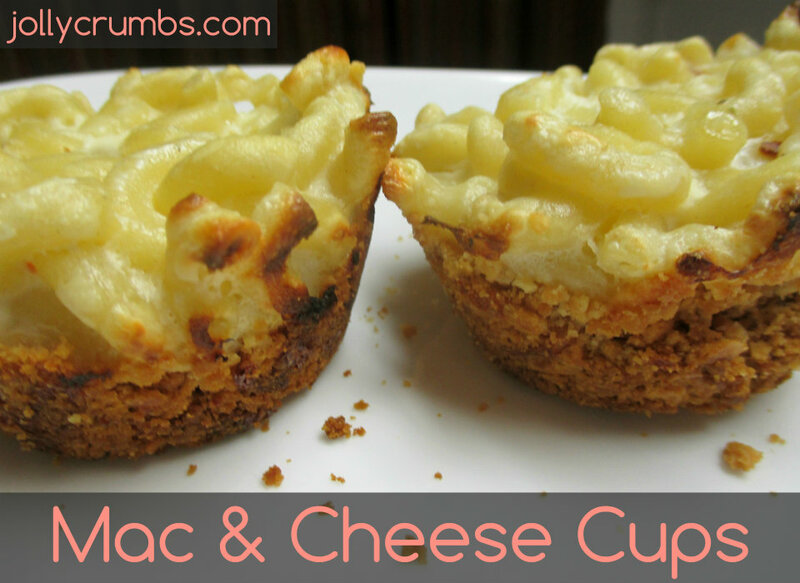 Bake the mac and cheese cups for about 20 to 25 minutes, or until the tops are starting to get a little golden. They should be firm and baked through. Let cool slightly before removing them from the pan. Serve warm. If looks alone don’t get you to try these, I can only reassure you these are delicious. The crust is delicious and buttery. The macaroni is filled with a delicious extra sharp white cheddar and garlic cheese. These are perfect for anyone who loves mac and cheese. If you want them cheesier, feel free to add more in. Otherwise, you’ll love these the way they are. And they are much lower in calorie than regular mac and cheese. Also, there was leftover mac and cheese, which I baked into an 8×8 pan. You could bake the mac and cheese into a 13×9 if you didn’t want to make cups. Any way you do this, this recipe is delicious. Preheat oven to 350°F. Spray 8 cups in a muffin pan with cooking spray. Also grease a small baking pan for left over macaroni (I used an 8×8). In a large bowl, mix together the crushed crackers, 1 cup shredded cheese, and melted margarine. Mix well until the mixture holds together and resembles coarse sand. Divide the mixture amongst the 8 prepared muffin cups. Using a spoon or your fingers, firmly press the crumb mixture into the bottoms and sides of the 8 cups. Cook the macaroni for about two minutes less than what the box directions call for. When it is done, drain it. Mix the hot macaroni with the ½ cup extra sharp cheddar, garlic and herb cheese, and lite margarine in a large bowl until everything melts together completely. In a separate bowl, combine the egg whites, milk, sour cream, salt, and red pepper flakes. Mix well. Add the milk mixture to the macaroni mixture. Stir together until all the ingredients are melted and smooth. Place about 2 to 3 tablespoons of the macaroni mixture into each muffin cup. You will want to fill each cup up to the top. Place leftover macaroni into the prepared baking pan. 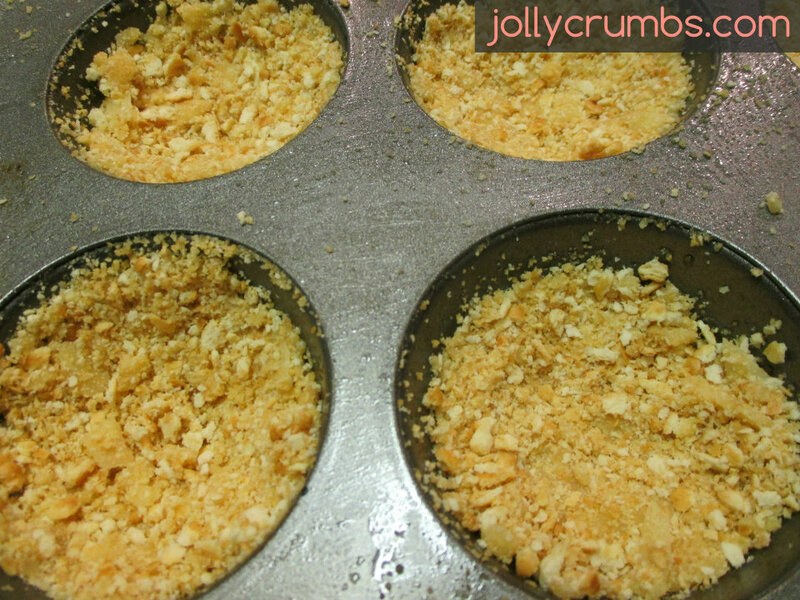 Bake the mac and cheese cups for about 20 to 25 minutes, or until the tops are starting to get a little golden. They should be firm and baked through. Let cool slightly before removing them from the pan. Serve warm. For the cracker crust, if it is too dry when you mix it together, you can add in another tablespoon of melted margarine. I just have to tell you that I love your recipes. You post a great variety, and we seem to have similar tastes! Can’t wait to try this one. I think my husband will want to propose to you, as he is a mac and cheese connoisseur, haha! Aw thank you for such wonderful feedback Alison! I’m glad you are enjoying my blog. Hope you and your husband like this recipe! This mac and cheese looks amazing! I am extremely partial to mine, but I will most definitely give this a try! The crust definitely makes this one a little different. This isn’t as creamy of a mac and cheese, but the flavors are really great! I made these cups the other night and you were right Chelsea, Faith loved them! and so did I! They were so flavorful and I loved the crust! Yay! I am glad to hear these are Faith-approved. I also really love the crust on these.